Tattooing is big business in Scotland today. 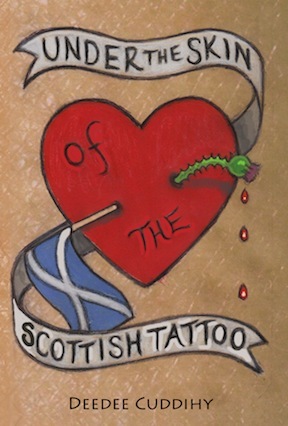 Glasgow journalist, Deedee Cuddihy interviewed dozens of tattooers and tattooees, and combed the internet and print media, for this unique - and often hilarious - look under the skin of Scotland's contemporary tattoo scene. Read about: the man who got his first tattoo in a Clydeside graveyard; the girl who spent household emergency funds on tattooed angel wings; how tattooists deal with smelly feet, BO and intimate parts of the body; and why people love their tattoos - even the ones they know aren't good. My step-daughter's getting her first tattoo today. She's studying zoology so she's getting a trilobite. I've got tattoos and her mum's got tattoos so we've been joking that she was bringing shame on the family by not having one.